The Tuffest Spa on the market just got Tuffer! This new and exclusive cover design holds over 1000 pounds and never needs to be replaced, saving you hundreds! 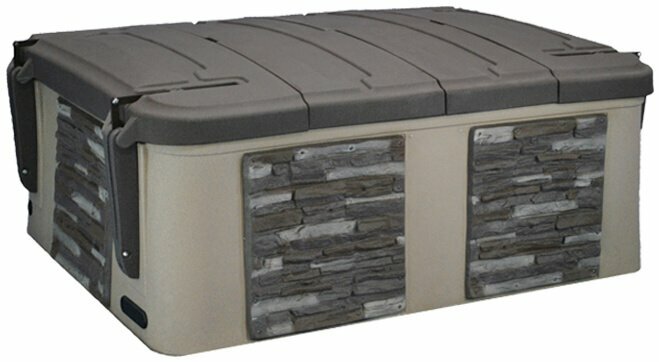 The cover makes your Tuff Spa even more energy efficient and has the same Lifetime Warranty as the shell of the spa! Finally a colored stone panel with a realistic finish! Our NEW colored stone offers a multicolor stack stone panel that is sure to enhance any backyard. Ask your local Tuff Spa dealer for details. Tuff Spas are made with Blue sTUFF Insulation which is made from thermally bonded recycled denim. This Natural Fiber Spa Insulation contains no fiberglass and does not cause itching or skin irritation. All models come with large access panels on each side of the spa which allows for easy access to the spa’s equipment; including the pump, heater, plumbing, jets, control panel, electrical hook-up, light and drain. This makes any maintenance on the spa simple and easy. Tuff Spas feature a solid one piece bottom, which allows you to place your spa on ANY flat, level surface. There is no need to spend extra money having a pad poured for your Tuff Spa. Please see the Installation page for more information on Site Preparation & Delivery. 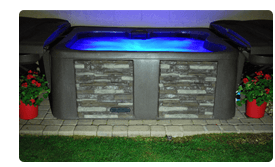 A multi colored LED light is included with all Tuff Spa Models to enhance the water’s appearance and create a soothing ambiance for a more enjoyable spa experience. There are multiple color options allow you to fit your light with your mood. 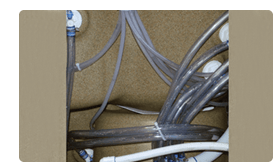 While most spas require expensive electrical wiring, all Tuff Spas come ready to plug into a standard outlet. This can save you thousands of dollars in electrical costs. 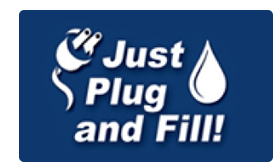 Just fill your Tuff Spa and plug it in, it’s that simple! All waste and trim pieces are recycled and reused. Lifetime warranty on shell that will not end up in a landfill. No volatile organic compounds like other spas. No Resin blown in manufacturing like other spas. Fewer emissions in manufacturing than other spas. One piece, heat-retaining shell improves energy efficiency. 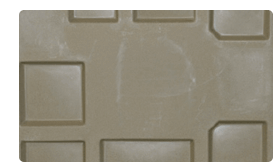 Hard-top cover with industrial gasket seals the cover to the shell, preventing heat loss. Two speed pumps filter and heat on low speed drawing minimal amps. 110V and 220V options offer far less amp draw and electrical usage than most spas. 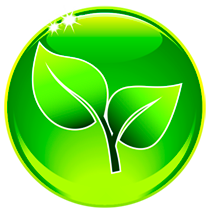 Made using natural gas, which is the cleanest burning fuel. No Fiberglass blown, unlike other spas. No Urethane blown, unlike other spas.